I’m a born and bred space nerd, so any movie that tells me a story I don’t already know about NASA’s golden age already has me at hello. Hidden Figures wasn’t as good a film as it was hyped to be, but that doesn’t mean it still wasn’t a great story told exceptionally well with a fantastic ensemble. It’s a both sad and practical problem that there have been so many films about discrimination that it’s sometimes hard to hammer home the vicious indignity of it without borrowing from previous efforts. What Hidden Figures did so well was to take an everyday reality for every person on the planet-using the restroom-and make it the film’s most poignant moment of the maddening unfairness of segregation. Kevin Costner and Taraji Henson both give fantastic performances in this film, and Henson’s quiet character finally losing her mind over the ridiculousness of having to run 30 minutes to find a “colored restroom” is a wonderfully written and performed monologue. Costner’s response has a lot fewer words in it, but then he got to do his talking with a crowbar. I have a huge soft spot for Zach Braff. I loved Scrubs until the MASH-like decline at the end and his directorial debut, Garden State with Natalie Portman had a huge impact on me. It was one of those convergences of your life experience and where you are colliding with a work of art and before you know it, you’re listening to the soundtrack for ten years. This, written, directed and starred in by Braff looks like it could be heart-breakingly fantastic. I will watch anything Mandy Patinkin is in so I’d go on that alone. It also has his Scrubs brother Donald Faison, Big Bang Theory’s Jim Parsons, Kate Hudson and the late James Avery among others. I’m onboard. Wish I Was Here opens nationwide on July 25, 2014. The Academy of Television Arts & Sciences announced the nominations for the 65th Primetime Emmy Awards this morning (because it’s not a busy time entertainment-wise). Peruse the nominees below along with the KT pick in each category, then tune in to watch the show, hosted by Neil Patrick Harris, on Sunday, September 22 on CBS. Overall, I have to say, the nominations are pretty dead on this year. KT Pick: As strong a group as you’ll ever find. Tough call, but Breaking Bad. KT Pick: 30 Rock as a farewell to an amazing series, plus Modern Family was a bit off its standard this season. KT Pick: Again, impossible to go wrong in this group. It’s criminal that Jon Hamm hasn’t won for Mad Men, but it also seems wrong not to give it to Bryan Cranston every year. However, Kevin Spacey ate the screen alive in House of Cards and carried that show in a way none of the others did and should take home the Emmy. Netflix is getting Emmy nominations. We live in Bizzarroland. KT Pick: Claire Danes won last year and should this year; awesome that Scandal got some recognition. KT Pick: Baldwin one last time for creating one of my favorite TV characters of all-time: Jack Donaghy. KT Pick: Give Amy Poehler a freaking Emmy! I don’t know why Parks and Rec gets no Emmy love. To not even nominate it when the state of TV comedy is at the lowest point in my lifetime, is ludicrous. I’ll be ok if Tina Fey gets it for not only starring, but creating, writing, producing and casting 30 Rock for seven years, but otherwise POEHLER! KT Pick: That’s a lot of star power for an Emmy category, proving that TV is eclipsing movies (in drama at least). I’ll be honest, I’ve seen none of these, but a founding principle in the Killing Time Charter of Behavior (not available, don’t ask) is that we root for Benedict Cumberbatch in all things. The year of Cumberbatchian dominance continues (though he’s facing 3 Oscar winners and an Oscar nominee so those aren’t betting odds)! KT Pick: How is AHS not an ongoing series? Again, haven’t seen any of them and I have no fundamental guiding doctrine on these actresses, so I’ll say Elizabeth Moss because she’s never going to win for Mad Men. KT Pick: Mandy Patinkin is the best thing about Homeland, but if Aaron Paul or Peter Dinklage win, that’s perfectly fine with me. KT Pick: I always want Maggie Smith to win everything she’s nominated for, but Christina Hendricks is fricking due. I usually have a problem with the Emmys and the comedy nominations are dismal, but they’ve nailed drama this year. Everyone here is stellar. KT Pick: Michael J. Fox’s recurring character on The Good Wife is always the season highlight. KT Pick: I think Linda Cardellini has this one pretty much sewn up. KT Pick: No Eric Stonestreet for Modern Family too? Really the whole cast deserves to be nominated every year, but it’s Ed O’Neill’s turn to win one. KT Pick: Same as the men, but it’s Sofia Vergara’s turn. Nice to see Jane Krakowski get a nod. Are there people not exhausted by Jane Lynch still? KT Pick: Justin Timberlake has somehow turned into the best SNL host of the last decade….it’s an odd world we live in, this. KT Pick: Elaine Stritch’s turn as Alec Baldwin’s mother has been one of the best things about 30 Rock over the entire show. Can’t deny her. I’d be afraid to. The woman is terrifying. KT Picks: Emmy for Spock, please! KT Picks: I have not seen the nominees other than AHS so Sarah Paulson it is. KT Picks: Give Betty White anything she wants. The woman’s had the best back 20 years of a century of anyone in television history. She’s the Christopher Lee of TV. KT Picks: It’s won this category every year but once since it was invented and it’s won it for a reason. Amazing Race!!! KT Picks: SNL had a rough year and I’d rather see Letterman here, but The Daily Show and Colbert Report both operate at a level of outstanding writing and comedy far beyond the rest. KT Picks: AHS. 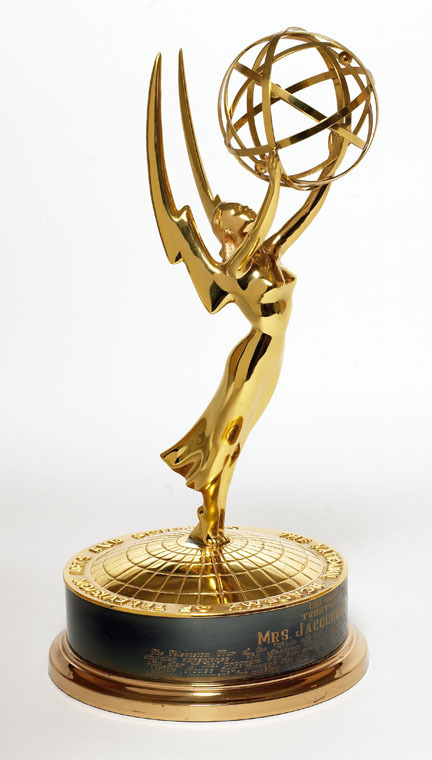 I find the possibility of The Bible getting an Emmy kind of hilarious. Perhaps it’s because I’ve grown up with it, but it’s like the Oxford Dictionary winning an Oscar to me. KT Picks: Either Breaking Bad is deserving, but Game of Thrones second season finale kicked the series into a whole new gear. KT Picks: House of Cards smacks you between the eyes with its pilot and doesn’t let go of you until you’ve binge-watched the entire thing wondering where 10 hours went. KT Picks: The Office left us three years ago and its corpse has been on TV, so recognize a proper goodbye from 30 Rock (yeah, I’m trying super hard not to make Hogcock jokes….I’ll save them for my wife; she’ll be so thrilled). KT Picks: You had me at “hogcock”. You had me at “hogcock”. I’ll miss you, 30 Rock. KT Picks: I must plead out on these as I’ve not seen any yet. Is Hogcock not going to be nominated for more things that I can pick it for? I’m confused. KT Picks: Hogcock wins in a write-in landslide…perpetrated by me. KT Picks: Seth Meyers has been the most consistently good thing about SNL this year. KT Picks: Colbert or Stewart in a tie that must be broken by best use of Hogcock in a joke beaten to death buried in the middle of a 2000 word piece. KT Picks: Golden Globes if Tina and Amy get Emmys for best tag team hosts ever.